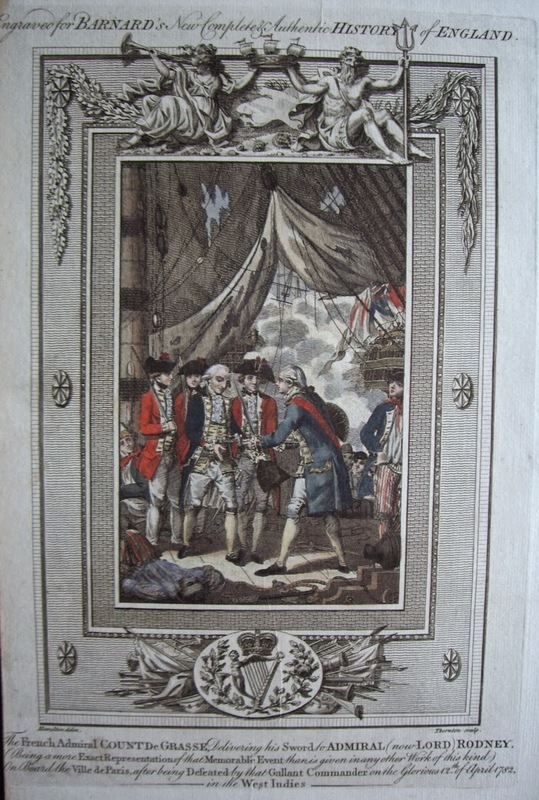 "The French Admiral Count De Grasse, Delivering his Sword to Admiral (now Lord) Rodney (Being a more Exact Representation of that Memorable Event than is given in any other Work of this kind) On Board the Ville de Paris after being Defeated by that Gallant Commander on the Glorious 12th of April 1782 in the West Indies," John Thornton, National Maritime Museum. Aside from the preposterously long title of this piece, the National Maritime Museum has little information regarding it. Thankfully, a copy of the original, drawn from Barnard's History of England, is available on Wikimedia Commons. What's more, it gives us our date (1785) and is in color! 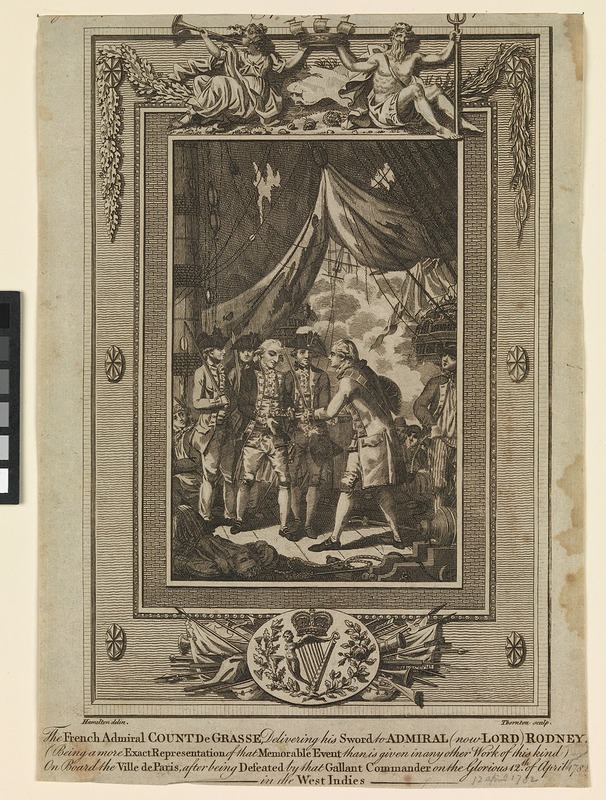 It depicts an event we've seen before on this blog: the surrender of Admiral De Grasse at the Battle of the Saintes. The French Admiral, the same who ensured victory in North America for both the Americans and the French, was forced to strike his colors after four days of battle. Here he stands on the quarter deck of his own ship the Ville de Paris. That ship is where this image is set. This raises a few questions for us. There is only one good image of a common tar in this image. Who is he? Is he accompanying the mass of men in the background who appear to be climbing aboard in support of the British officers? Or is he a member of De Grasse's crew, some of whom we can see on the opposite side of the image? The sailor, whether he be British or French, is typical. He wears a short blue jacket with white lining, a shirt without a waistcoat, red neckcloth, cocked hat with the point forward and trimmed with tape, and trousers with vertical red stripes.